Internet of things (IoT) continues to grow with the creation of smart devices and will have a great impact on the creation of smart homes. Samsung is not being left behind in the race for this market. In the lead up to this race, Samsung is unveiling Samsung Smart Home to integrate smartphones, Smart TVs and Home appliances. Initially Samsung will provide three main service features for this platform: Device Control, Home View and Smart Customer Service. A simple smartphone app will allow device owners to control and monitor their home appliances from wherever they are. This will be available through voice commands and over chat. A dedicated Smart Home software protocol (SHP) has been created to convey communication between the users control panel and the different appliances. 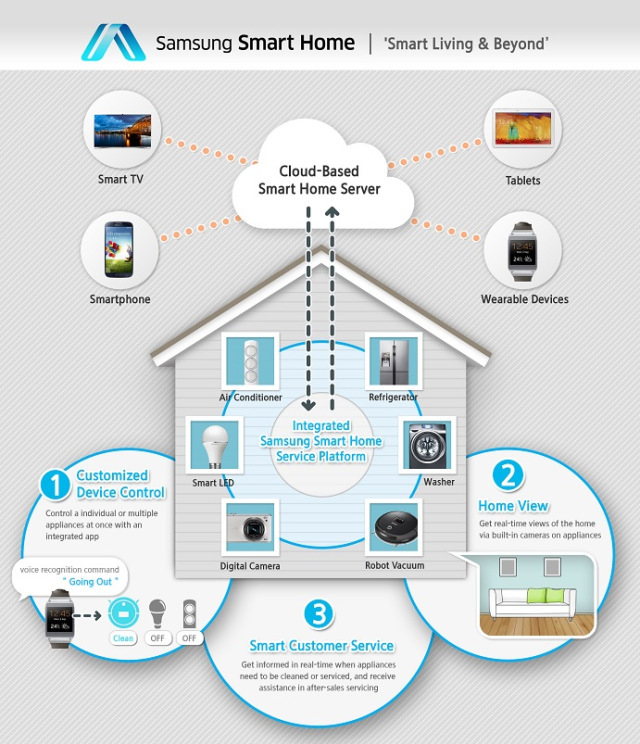 Samsung is currently courting device and appliance manufacturers to create partnerships through which their connected home services will be delivered. These partnerhips with third party service providers, Samsung’s next move is to expand into home-energy, secure home access, healthcare and eco home applications.